Free Webinar: Why Conduct a Climate Change Vulnerability Assessment? This free webinar was hosted by the Institute for Tribal Environmental Professionals (ITEP) Climate Change Program. It is an installment of the Topics in Climate Change Adaptation Planning webinar series. 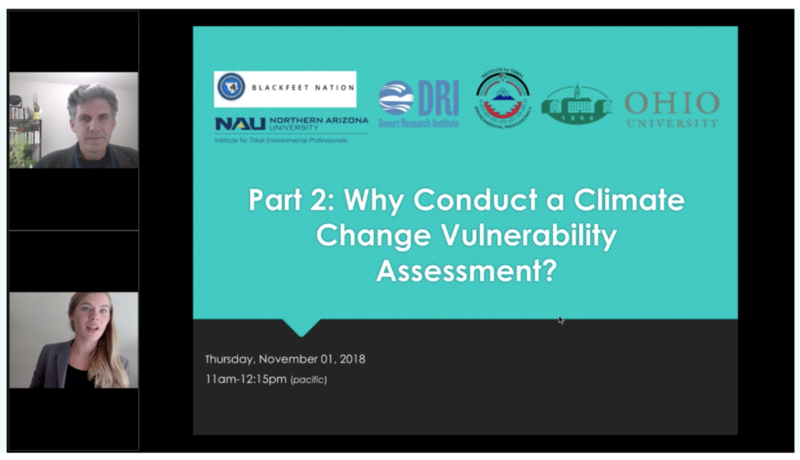 The webinar was presented by NWAL team members Derek Kauneckis, Ph.D., Associate Professor, Voinovich School of Leadership & Public Affairs at Ohio University; Anna Palmer, Research Faculty with the Division of Earth and Ecosystems Science at the Desert Research Institute; and Gerald Wagner, Director of the Blackfeet Environmental Office.